The Strumento Ritocco is used to make small changes to paths and colors. While at first paths and colors may seem to have little to do with each other, the use of Strumento Ritocco to edit them is surprisingly very similar. To use the Strumento Ritocco select the tool from the Casella degli Strumenti ( ) or use either of the shortcuts: W or Shift+F2. Width: Determines the size of the brush. The range is from 1 to 100, where 20 corresponds to a radius of 100 screen pixels. As the brush width is independent of zoom, zoom can be used to quickly change the size of the brush relative to the size of an object. The Left Arrow and Right Arrow keys can be used to decrease and increase the width at anytime. Home sets the Width to 1 while End sets it to 100. Force: Determines how strongly a movement of the brush affects the objects on the screen. The range is from 1 to 100. If the «Use Pressure» button ( ) is toggled on, a pressure-sensitive tablet can be used to control the force; maximum pressure corresponds to the Force parameter setting. See the Strumento Pennino section for use of a tablet. The Up Arrow and Down Arrow keys can be used to decrease and increase the (maximum) Force. The Strumento Ritocco has a number of modes for editing paths and colors. The mode is selected by clicking on the corresponding icon in the Controlli Strumento or using a keyboard shortcut. Each mode has its own cursor. The various modes are discussed in the next two sections. Objects must be selected to be tweaked. Using the Space Bar is a quick way to switch back and forth between the Strumento Selettore and the Strumento Ritocco. Note that there is no onscreen indication of what objects are selected when the Strumento Ritocco is in use. An example of using the Strumento Ritocco on a series of Rettangoli. 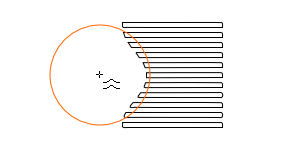 The brush size is indicated by the orange circle and the Mode by the cursor (in this case Push).